Old Crescent holds successful Presidents Awards Night! After such a magnificent season, the Old Crescent RFC President’s Awards Dinner was always going to be a huge success and so it proved when over 150 members and guests got together for the Awards Dinner in the Clayton Hotel in Limerick last Saturday evening. 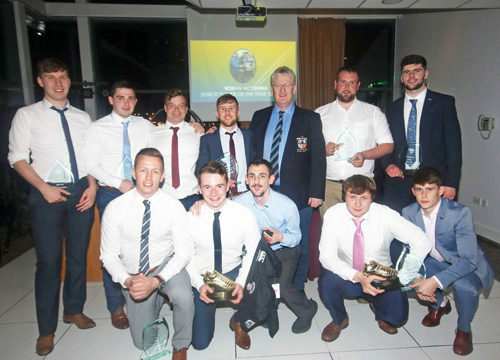 Pictured at the Old Crescent RFC Presidents Awards Dinner were, at back l-r, Geoffrey Coyne, 2nds Team Player of the Year, Ronan McKenna, 1st Team Player of the Year, Darragh O’Brien, Club Captain, Gary Fitzgerald, Team Choice Award, Tim Duggan, President, Robbie Walker, 3rd Team Player of the Year, Cian Reale, Team Spirit Award. Front l-r, Shane Mullally, Team Leader Award, Val McDermott, Golden Boot Award, Mikey O’Doherty, Old Crescent’s No.1 Fan, Seaghan Gleeson, Golden Boot Award, and Timothy Duggan, Young Player of the Year. ◂ Another Under Age Cup Final Win for Old Crescent RFC!